If we go into hostile territory, foggy with exhaustion, we won’t rescue anyone. Here it is, the special bonus video for you backers who kindly part with $5 or more a month to support the Esoteric Order of Gamers. You are wonderful people! (My $2 backers are great too, but not everyone can get all the perks!) 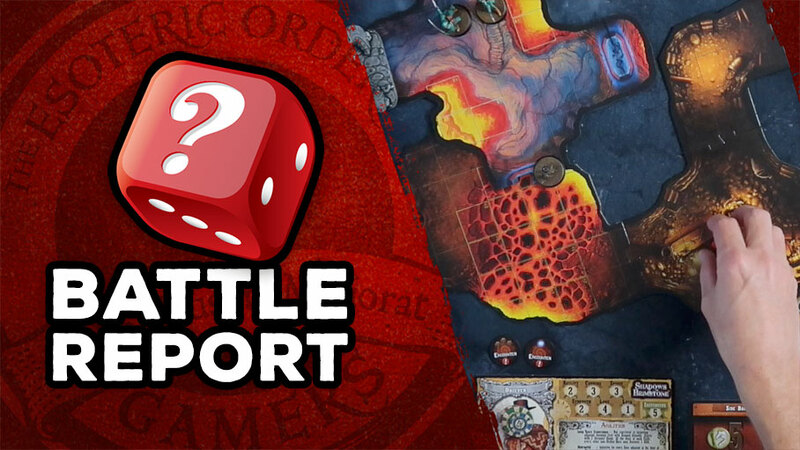 this month I try a solo run through Shadows of Brimstone—just a lonely drifter entering a mine and (spoiler alert) dying horribly. Enjoy! Of course, I could have lasted longer if I’d remembered I had 2 ‘Revive’ tokens at my disposal. But then we’d be here all day wouldn’t we? And by the way, I whinge about the tiles not fitting together at the end, but because I’ve crossed into a separate other world through a gate, the two areas aren’t supposed to fit together—there should be ‘end caps’ on those connecting corridors.